TALLAHASSEE– Florida Highway Patrol (FHP) Director, Colonel Gene Spaulding, announced that Major Michael Thomas will be the new deputy director of the Patrol effective today, September 4, 2015. As Troop Commander of Troop C (Tampa area), Major Thomas acquired a great deal of experience and an excellent working knowledge of FHP operations in the field. As he takes on his new position within the Patrol, Lt. 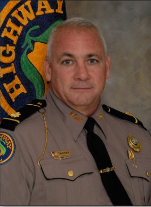 Colonel Thomas will bring a fresh perspective to help lead FHP operations throughout the sunshine state. Lt. Colonel Thomas graduated from the 79th FHP Basic Recruit Class on May 5, 1987. During his tenure at FHP, he has served in six of the 10 patrol troops, starting in Troop L, Davie. In September of 1989, he was appointed to the position of K-9 handler as part of a two man CIU team and assigned to Troop Q. In 1996, he was promoted to Sergeant and assigned to Troop E where he worked until 1998, when he transferred back to Troop L, Davie. In 1998, he was promoted to Lieutenant and transferred to Troop E, Miami. In 2003, he transferred to Troop B, Marion County, where he worked until he was promoted to Captain in 2009 and assigned to Troop D Orlando as the District Commander overseeing Orange and Osceola Counties. In 2011, he was promoted to Major as the Troop Commander for Troop C, Tampa, where his first big challenge was coordinating the Republican National Convention. Lt. Colonel Thomas holds a B.A. in Public Administration from Barry University and is scheduled to receive his Master’s degree from the Naval Post Graduate School this December.